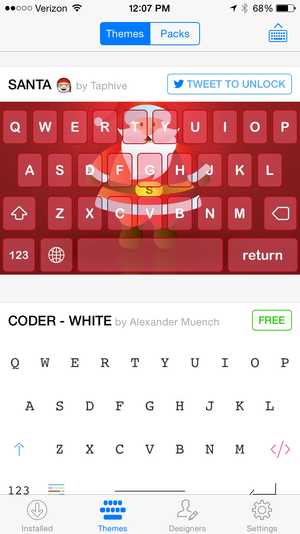 There’s a Themeboard keyboard to fit just about any taste, whether you’re into coding or Kris Kringle. But when it comes to keyboards, it’s pretty much been the Wild West. Aside from some early fear and uncertainty over the “Allow Full Access” button, and the temporary removal of Nintype’s calculator function, we’ve been downloading and installing with impunity since day one. It’s been somewhat surprising just how relaxed Apple has been about what’s allowed to grace the bottom of our screens; whether they’ve helped us type faster or simply added a bit of flair to our favorite text editors, it’s fair to say that the influx of third-party keyboards has been the biggest change to the iOS way of life since the opening of the App Store. That sort of freedom has allowed developers to let their creativity roam. 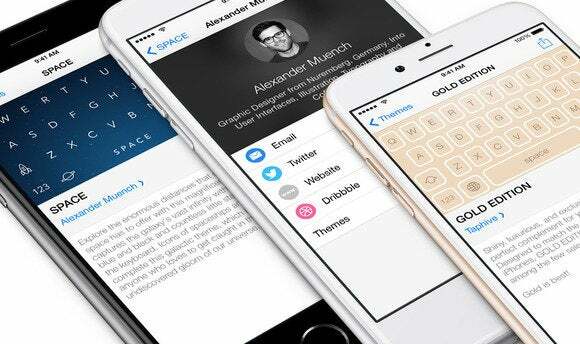 In just a few short months, we’ve seen everything from psychedelic skins to letter-less gif and emoji keypads, all offering a remarkable level of personalization we never thought possible on an Apple device. It’s a veritable playground for developers, and nowhere has this rebellious spirit been embraced more than with Themeboard. Built by Taphive, the same prodigious minds that brought us TodoMovies and Tick, Themeboard isn’t actually a single keyboard: It’s a whole catalog of them. 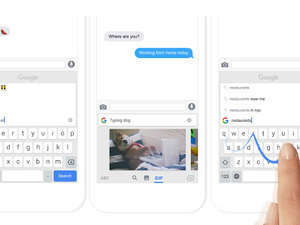 Wild keyboard customization isn’t necessary a novel concept—apps like Ginger and Rainbow already offer plenty of options for fickle typists—but Themeboard doesn’t merely offer a set of interchangeable colors and background pictures. Rather, it has set itself up as a depository where designers can experiment and share their creations without the fear of getting lost among the Fleksys and Swiftkeys of the world. Themeboards row of multiple choice text options looks a lot like Apple’s, but it doesn’t always act the same. Themeboard is essentially a layer on top of Apple’s existing structure. It installs just the same as a regular keyboard, but once it’s in place, you can visit the companion app to choose from a variety of free and paid themes that add everything from fun icons and vivid colors to quirky fonts and gorgeous background images. And Taphive has implemented a few excellent features too. To solve the all-too-accidental method of tapping the globe icon to switch keyboards, Hassan flipped Apple’s method to one that makes more sense—when using a Themeboard keyboard, tapping the globe brings up a scrollable row of emojis, and you’ll have to long-press if you want to switch to another keyboard. 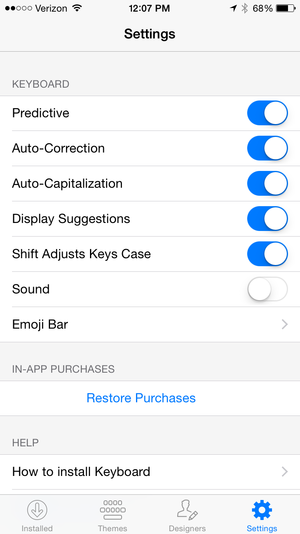 And there’s a nifty toggle in the settings that will animate the key case whenever the shift key is tapped. But good looks and smart navigation is only half the story, and here’s where things get tricky. If you’re fighting with Themeboard’s auto-correction too much, you can always turn it off. Apple doesn’t offer much help for anything beyond simple layout templates and button placement, so Taphive tackled the monumental task of building in-house versions of autocorrect, predicative text, and smart capitalization. Otherwise, every one of Themeboard’s designers would need to start from square one when it came to text input, and Hassan wanted a uniform experience across all of the keyboards. 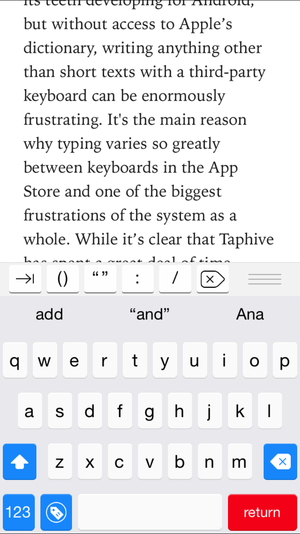 It’s not quite as obvious when you use one of the keyboards that cut its teeth developing for Android, but without access to Apple’s dictionary, writing anything other than short texts with a third-party keyboard can be enormously frustrating. It’s the main reason why typing varies so greatly between keyboards in the App Store and one of the biggest frustrations of the system as a whole. While it’s clear that Taphive has spent a great deal of time crafting its corrective text, it often fixes errors in unexpected ways, something Themeboard’s team is constantly working to improve. But Hassan’s frustrations run deeper than a little hard work. Apple has squashed a good number of the crippling bugs that plagued third-party keyboards at the start, but many smaller ones remain, making it hard to fully adopt any of them for serious writing sessions. While he understands this from a user standpoint, Hassan wishes Apple would do more to help developers keep their keyboards tapping smoothly. And that’s not to mention the lack of support for interactive notifications, text selection and dictation, as well as the whole wonky installation process. Much like the wishy-washy widget policy, it seems that Apple is somewhat reticent to fully embrace the world of third-party keyboards, holding back on allowing developers to incorporate its existing system-wide tools into their own designs. Hassan has built a very impressive system in Themeboard that actually improves on some of Apple’s flaws, but ultimately the road to a successful iOS keyboard is fraught with potholes and roadblocks. But he isn’t about to give up. Hassan called the keyboard API “the most primitive I ever worked with so far,” but he has big plans for Themeboard, including the development of an SDK to bring its unique designs to other keyboard apps. But it’s a pretty safe bet we won’t be able to ever use it on the one Apple makes.